Problem: Sometimes it is necessary to search for a word when the spelling is not known. Solution: Use one of SwordSearcher's word suggestion features to find the word or words you're looking for. In this example we will explore searching for a word in the KJV when we are not sure of the spelling of the word. This is fairly common as the KJV uses British spellings rather than American spellings. For example, "savior" is spelled "saviour" in the KJV. 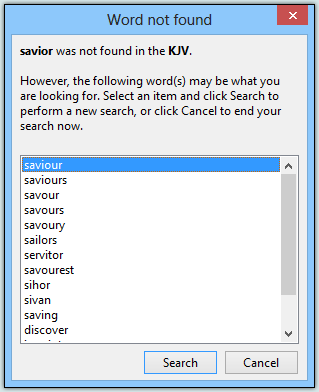 The Go to Verse and Search toolbar can be used to suggest word searches when you attempt to search for a word that does not exist in the active Bible. 1. 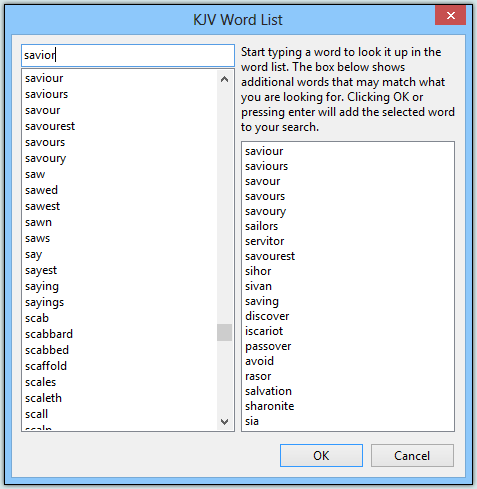 Make the KJV the active Bible (by clicking its tab in the Bible panel), then type the word as best you can in the Search toolbar. The advanced Bible Search dialog includes a Word List function that will help you locate words in the Bible text you are searching. 2. Click the Use Word List button. In the top-left text box, you can start typing the word. Both lists of words constantly update as you type. The list on the left is an alphabetical listing of all of the words in the selected Bible text. As you type, it scrolls to select the first exact-matching word. The list on the right is a list of words that may match what you are seeking. As you type, it updates to show words that are the best possible matches. When you see the word you are looking for, click it (in either list), then click OK to add it to the list of words you want to search for. 3. The word you selected is now in your Search Text box. Click Do Search to perform the search.